This project could be used to address K-PS2-1 Plan and conduct an investigation to compare the effects of different strengths or different directions of pushes and pulls on the motion of an object 3-PS2-1 Plan and conduct an investigation to provide evidence of the effects of balanced and unbalanced forces on the motion of an object. While working as an engineer in a factory, a mechanic once told me all the machinery could be broken down into a series of simple machines. I want to teach this concept to my son, so I've been coming up with examples of simple machines for him to explore. The boy loves finding patterns, and the simple machine activities help him realize patterns exist in the real world. The first simple machine he explored was a lever. I introduced him to levers through building and experimenting with a catapult. He loved building and playing with the catapult, especially since he it gave him a chance to chunk things into the air. To continue experimenting with levers, I looked to another simple example of a lever, a seesaw. I knew a seesaw would be a familiar example he would enjoy exploring. I wanted to use materials we already had at home because experimenting shouldn't break the bank. After some brainstorming, I came up with a simple and inexpensive seesaw design! 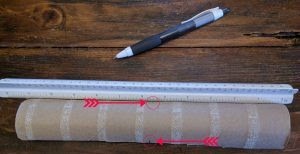 Using a ruler and pen, mark the center of the halved paper towel roll. 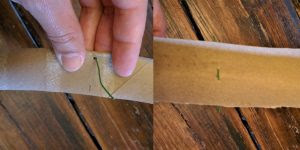 Fold the halved paper towel roll in-half lengthwise, and poke two holes through the folded roll at the center location marked in Step 2. Make the holes into slots, to allow for horizontal adjustment. Straighten the ornament hanger into a line. 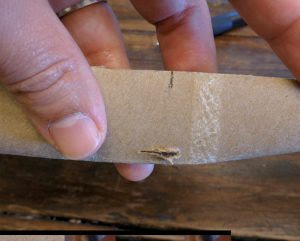 Pull the ornament hanger through the two holes in the paper towel roll, and unfold the halved roll. Separate the playdough into two balls of the same size. Form the playdough into "columns". These will be the supports for the pivot point, or FULCRUM, of the seesaw. Adjust the seesaw until it is balanced by adjusting the ornament hanger in the slotted hole. Now it is time to play with the seesaw! I asked my son to put a weight at the end of the balanced seesaw to see what happened. I then told him to use the remaining weights to balance the seesaw again. It took him a little while and adjusting, but he was eventually able to find the sweet spot and balance the seesaw. Now I told my son I was going to move the fulcrum. Me: Its the playdough and wire. The fulcrum is where the seesaw is pivoting. 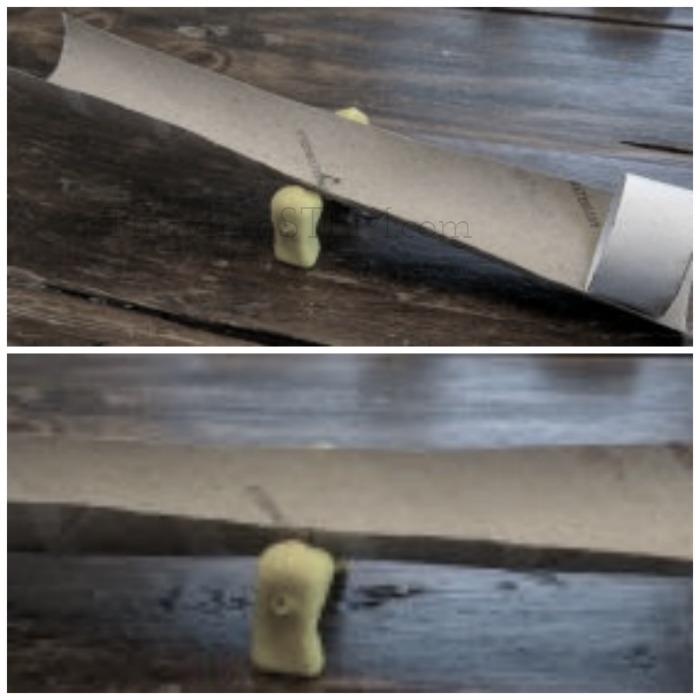 I moved the fulcrum from the center by making a new hole in the paper towel roll, and asked my son to guess how many weights it would take to balance the seesaw again. He had a great time experimenting with the weights, first adding a bunch on, and then taking some off. We moved the fulcrum two more times (each time a little closer to the middle) to see how the location of the fulcrum affected the see saw. To make sure he remembered the seesaw terminology, each time I changed the fulcrum I would ask him again what I was doing, and each time he would say "Moving the fulcrum". My son had fun playing with this simple seesaw. I loved watching him try to guess how to balance the seesaw each time I moved the fulcrum. He tried putting all the weight at the end of the seesaw, then tried spreading out the weight. While I didn't expressly tell my 6 year old, he was starting to learn about an engineering discipline called STATICS. Specifically he was experimenting with point load and distributed loads! And that's how I showed my son Engineering is fun! 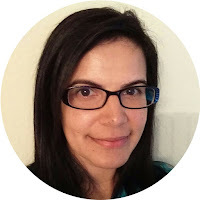 Christy is an engineer turned stay at home mom. After working as an engineer for over 10 years, she made the leap to stay home to raise her 3 rambunctious boys. But once an engineer, always an engineer. Now she teaches her sons about the world through her eyes, the eyes of an engineer. You won't want to miss this story about her mom, and you might be interested in how they used a toy car to teach mechanical engineering or this process engineering art project that you could do with any toy. 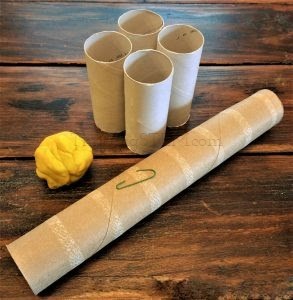 STEAM is always a great way to learn! 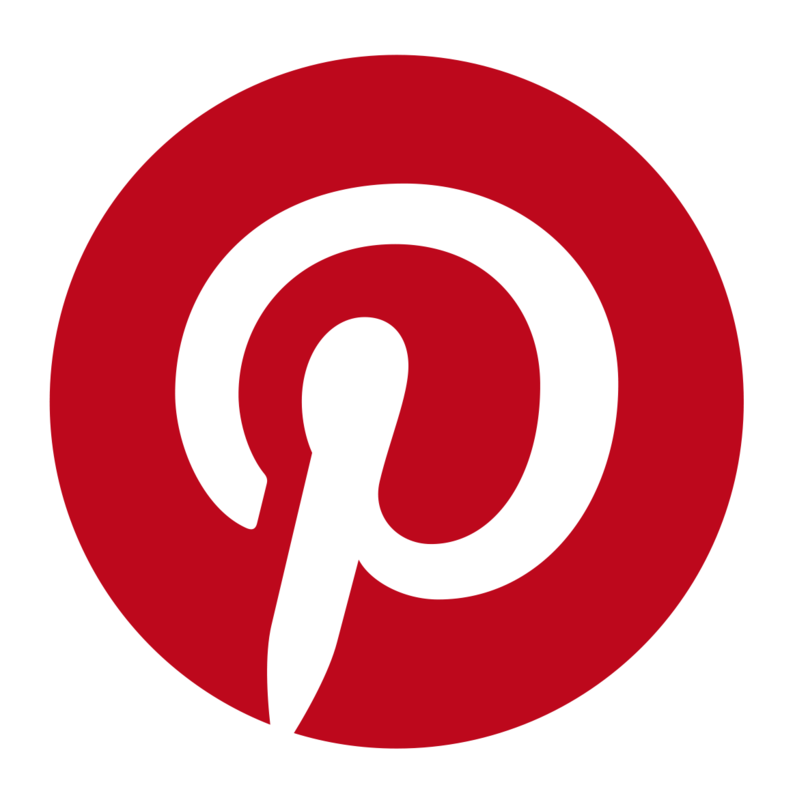 While you are over at Engineer to Stay at Home Mom, join me in subscribing to Christy's newsletter. I am excited to hear more of her insights on how we can raise the next generation of engineers!